Summary: Kagome finds herself homeless thanks to her rowdy roomies and has to move in with her best guy friends… and Sesshoumaru. He finds him self suffering from a strange combination of ailments, something his father calls simply ‘The Syndrome’. Will he be able to survive the symptoms so he can live to gain the cure? 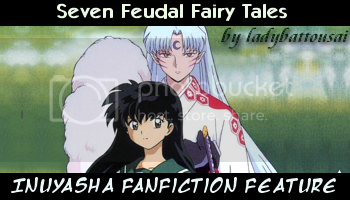 After reading a poetry scroll amongst the relics once belonging to Inuyasha's mother, Kagome traps herself and Sesshoumaru in another world, where they must journey through seven, different fairy tales and complete the poem if they wish to return home. Sesshoumaru wanted more than a mate. He wanted her, Kagome. Surrounded by those that would stand between them, they will take on the prejudices of the modern world while forging an unbreakable bond in the fires of his Hallowed Desire. Summary: Kagome is abandonded by her father and gets adopted by neighboring college boys. Will no longer be updated on this site. See Author's note in first chapter. Sesshoumaru needs the help of a miko, and only one will do. His request for aid sets in motion an ancient prophecy, leading them all on an unexpected quest. Secrets kept for years finally are told, and an unsuspecting Kagome is thrust into a mission with a whole new set of tasks and troubles. She is the priestess spoken of in the prophecy, the one sent to redeem Midoriko, and her already strange life is once again turned upside-down. Under revisions... Will be updated eventually, I promise!! No new chapters yet.